This is a series of 10 truly excellent posts by Amy Herzog. You can view them on her blog by clicking on the title of each post or you can buy the series as a PDF. The series starts out with a great analysis of body shapes and clothes that flatter them. Then it talks, in detail, about each design element and how to spot them in knitted sweaters. And finally, it walks through designing your own sweater or modifying one you love to flatter you. I read through these and found out that I look best in sweaters with a strong horizontal element at the top and three-quarter sleeves. Which is great, because I love three-quarter sleeves. 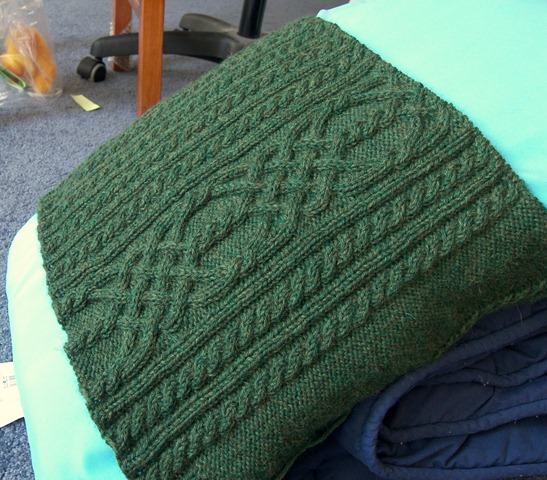 The horizontal element could be a wide neckline, a colorwork yolk, or raglan shaping. It works, too- I bought some shirts that fit my new rules, and they look great on me! Because of this, I have changed my mind on the February Lady Sweater, which is fine, since I never started it anyway. But I still have all that lovely merino/tencel yarn for it. Right now I’m crushing on the Maple Grove cardigan pretty hard. Wide neckline, raglan shaping, cropped short- it fits all my new rules. Plus it looks pretty fun to knit; I love the sleeves. It was a shock to see it’s not on Ravelry though. I’ve come to rely on Ravelry when I look at a pattern to see what other people have done with it or how it looks on them. Not having that extra info makes me feel blind. Did I really live this way all the time before the internet?! So quickly I get used to technology, sigh. I had the weirdest dream last night. I was soaking my CPH to wash and reblock it. Only I was soaking it in bleach! (Bleach dissolves wool, in case you didn’t know.) In the dream, I used bleach on purpose so that I would ruin the CPH and have to knit something new. But then I look over at my “Project Progress” sidebar. There’s a lot of stuff over there. And that’s not even a full list- I don’t want to lose your respect! Even if I ignore all the projects on needles smaller than size 4 (3.50 mm), I still shouldn’t be thinking about a sweater for myself. I started a sweater for Lowell in November and it’s still sitting at about 14” long! Shown here being worn by the famous model, Spare Pillow. I don’t think Lowell is interested in a short woolen tube top, so I really should get moving on that and add sleeves and maybe even some shoulders. Of course, it’s getting warmer now (at least, it’s supposed to be getting warmer; there’s some hail that was left off the memo) and maybe he won’t notice if I don’t finish the sweater until next November? 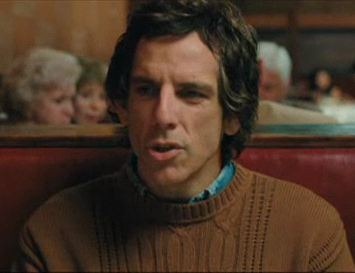 I could tell him that it’s sitting in the dresser- with sleeves and everything!- and he’d never know until it got cold enough again to go looking for a wool sweater. I pulled the Lowell-sweater bag out of the hall closet where it had been hibernating and put it next to me on the couch, with the hope that this would remind me to work on it. Or maybe that my powerful knitting brainwaves would would work on it while I worked on something else. I have to quickly reknit a pair of socks for the Sanguine Gryphon to sell (the pattern, not the socks themselves). You have not seen these socks yet, but you will. I think you’ll like them. Even if I wanted to work on something new or Lowell’s sweater, I can’t work on anything else until I finish these socks. Good news: I’m on the heel of the first sock. Bad news: I’m only on the heel of the first sock. But a little search of Ravelry for cardigans couldn’t take up too much time, right? I narrowed it down to the February Lady Sweater, Mehndi from the latest Twist Collective, and Decimal from Knitty Spring 09. I decided on the February Lady Sweater. 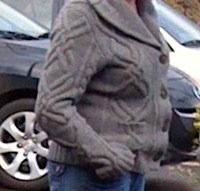 I’m not sure why, since I have seen this sweater many times and it never sparked any sort of reaction before. But this time I kept coming back to it. I like the 3/4 sleeves and the three buttons just on the top and the raglan shoulders. Lace always makes me think a project will go quickly. I think it’s because of all the little holes- it seems like there’s less knitting involved to make lace than stockinette. Obviously, this idea is wrong, so you can stop writing your hate mail right now. It’s just a gut reaction. I promise you, I rue the reaction while I struggle to make all the ssks and yos line up correctly and then realize I have three stitches leftover at the end of the row. Yet I always think that lace will go quickly. The pattern is simple and straightforward. It’s an adaptation of Elizabeth Zimmerman’s Baby Sweater on Two Needles. Garter stitch and a simple 4-row lace pattern, no waist shaping, no sewing. I was hooked. And then I remembered that I’m going to my sister’s undergrad graduation in late May. I thought, maybe I could finish this sweater in some luscious yarn like Dream in Color Classy and pair it with a dark shirt and nice skirt and bam!- I have an outfit without having to shop! I hate shopping for “nice” clothes so much that I would rather spend the day scrubbing hard water stains from the toilet bowl. Which I did last week. So making myself an outfit seemed so much more pleasant. Then reality sunk in and reminded me that it’s already in the 70s in Virginia and it’s only April. Temperatures will be well into the 80s or even 90s by May 22. No way I’m wearing a wool sweater, even if it’s lacy, in Virginia in May. Thus started the Great Summer Yarn Search of 2010 (for a Cardigan that I’m Not Even Going to Make Because I Haven’t Finished Lowell’s Sweater and even if I Did I Wouldn’t Be Able to Finish It Before I Leave on the 18th of May Because of All the Other Things I Have to Do). But I’m leaning towards something with Tencel in it. It has such a nice sheen. I love my CPH. I loved knitting it. I love wearing it. Do you know what this means? It means that I can’t stop looking at sweaters and wanting to knit them. 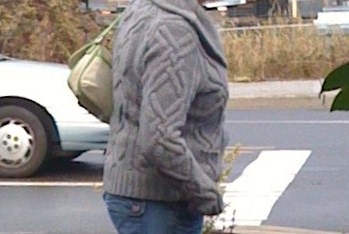 Last week, I was running errands and saw a woman wearing an awesome sweater out the window. I tried to kinnear the sweater as best I could. I love the huge cables on that thing. I wish I had gotten a better picture of the back, though. According to my notes (yes, I kinneared and took notes!) the back had two of the arm cables side by side and they interlaced together. We went to see a movie the other day and a preview for Greenberg was shown. I leaned over to Lowell and whispered, “I like his sweater!” I particularly like the lines of eyelets on the drop shoulder. This can’t be good. I mean, I already stare at people’s socks, hats, scarves and mittens. Now I’m going to stare at their sweaters and cardigans too?! I won’t be able to go anywhere without taking pictures of strangers and gazing intently at their shoulders to figure out what kind of sleeve they have. I’ve already started on a designed-from-scratch sweater for Lowell (almost 8 inches long now!) I’d post a picture of it, but if it turns out well I might want to submit it somewhere. I completely understand that magazines want their patterns to be a surprise, but it really puts a kink in the blogging, you know? Suffice to say that it has cables and the design relied heavily on Lowell’s input. 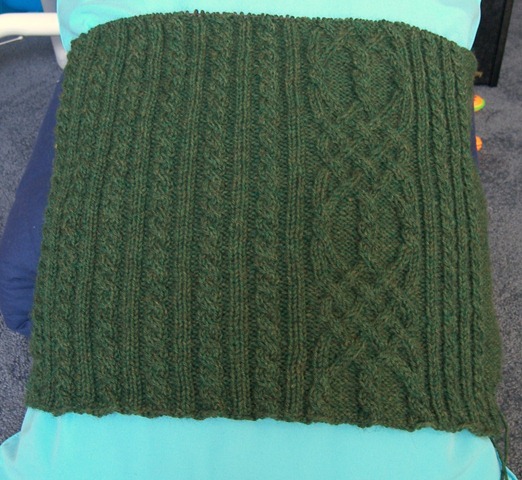 It’s based on Elizabeth Zimmerman’s seamless bottom-up saddle shoulder pattern from Knitting Without Tears. It’s also green.